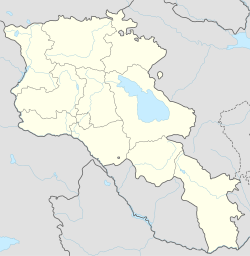 Privolnoye (Armenian: Պրիվոլնոյե), is a village in the Tashir Province of Armenia. Village is situated by the border with Georgia, 17 km on south-east from the center of region – Tashir. Privolnoye was founded in 1850. First residents were Russians who moved from Czarist Russia and inhabited different parts of the village. It is located 1585 m above the sea level. Winters are severely cold and summers cool. In dry years drought are very frequent. 4621.8 hectares of an overall land are agricultural lands, of which 1071.6 ha of arable land, 1480.11 hectares are hayfields and 1945.7 hectares are pastures.The residents are mostly engaged in animal husbandry and growing grains, potato, melons, pumpkin, cabbage and other vegetables. The village has a secondary school, a cultural center, a medical center and a post office. Privolnoye hosts a church from 1895 built by Russian inhabitants. The Khuchap Monastery is located here. This page was last edited on 17 January 2018, at 16:17 (UTC).